If your family vacation includes four-legged members too, The County has a wealth of places to go and things to do with your pooch – whether your dog fits in your handbag or needs his own sidecar. Be sure to tag your pup in the #DogsofTheCounty while you’re here! First, be sure your accommodation welcomes pets – don’t assume! 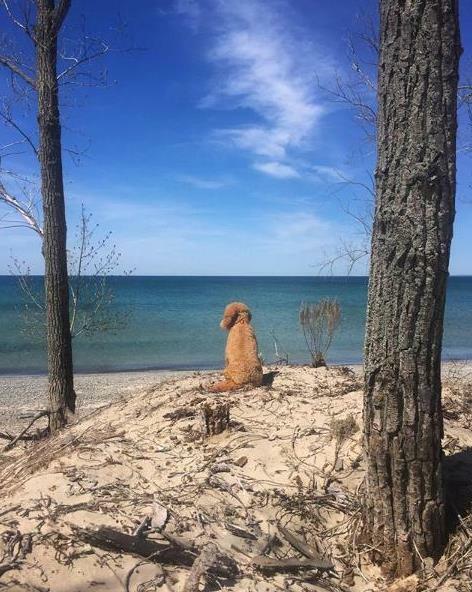 Sandbanks Provincial Park allows dogs in some camping areas. Angeline’s Inn welcomes dogs at the Walter Suites, for an additional cleaning charge. The newly refurbished Picton Harbour Inn welcomes pups in some rooms, for an extra $10 charge. Twin Birch Suites & Cottages welcomes any type of pet, from lizard to hamster. The Empire Inn + Suites in Bloomfield also welcomes pets for an additional cleaning fee. Miller’s House B&B has its own pooch and will welcome yours too. Huff Estates has a few rooms set aside for travelers with dogs. Picton has a massive, fenced dog park with a double-gated entrance at the northeast corner of Delhi Park. Park on Lalor Street and continue on foot down the wide path, or park in the Mary Street municipal lot and carefully make your way down the hill. The park has some seating, bowls of water and plenty of space for your well-behaved pooch to roam off-leash. All of The County’s conservation areas welcome dogs, so long as they’re kept on-leash and cleaned up after. Massassauga Point winds through an old quarry and hickory woods, providing views of the bay. Little Bluff has trails winding through sparse woods, leading to cliffs with dramatic views, and a stony beach. Macaulay Mountain has more challenging terrain, with hilly trails, and Beaver Meadow has some straightforward nature trails. Harry Smith has a small pond and an old sawmill, as well as picnic tables. On the South Shore, the National Wildlife Area welcomes dogs on-leash. The area is a mix of marsh, woods and grasslands, with several abandoned buildings and a heritage lighthouse. It’s a popular site with birdwatchers. There’s lots to sniff on the Millennium Trail, a former railway bed that runs from Picton to Carrying Place. The trail has been refurbished from end to end, providing a smooth path shaded by sumac and buckthorn. The trail shares space with the ATVs, walkers, runners, cyclists, skiers, snowshoers and the occasional golf cart or horse. Be aware that The County has ticks that carry lyme disease. Be sure to give your pooch the once-over after you’ve completed your walk. Sandbanks Provincial Park allows dogs on-leash at a portion of Outlet Beach, and Sandbanks Beach (Richardson’s) only. This is a family-friendly area, often jammed with sun-seekers in the summer time, so it’s recommended that dogs be socialized, easy to control, and on-leash. Wellington Beach also welcomes dogs on-leash. Wellington Heritage Museum is pet friendly, with a peaceful and shady heritage garden in the back and an exhibit on County portraits in 2019. The County Cider Company has a breathtaking view, set on a hill with grapevines leading down to Lake Ontario. 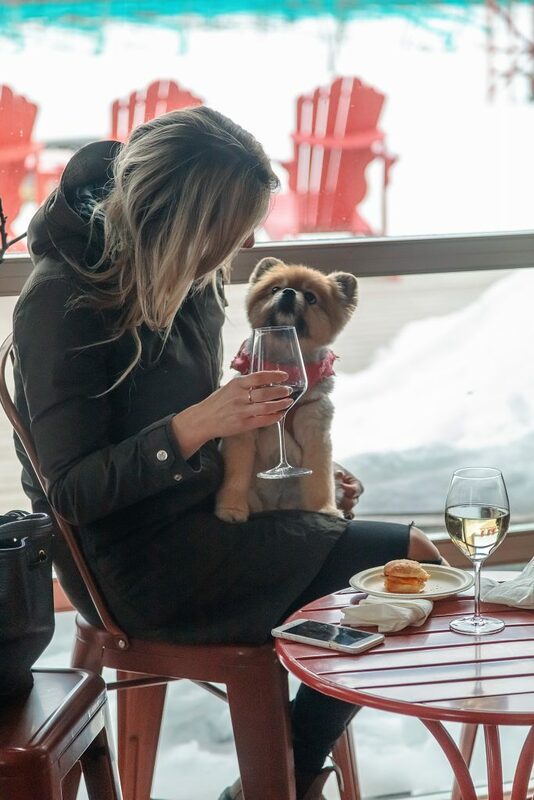 It also has a patio, pizza stove and rustic restaurant to take advantage of the view, with on-leash pooches welcome so long as they’re out of the way of servers and other diners. 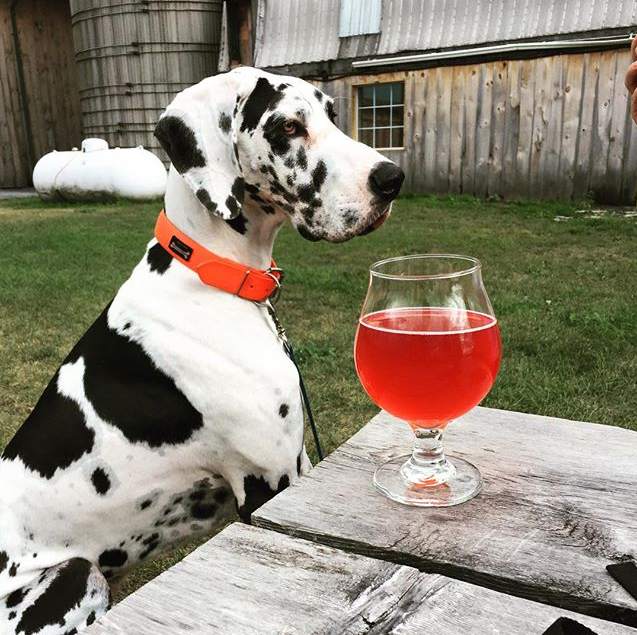 555 Brewing Company, in the heart of Picton, has a dog-friendly patio for enjoying pizza and pints. Or if you’re picking up a pint of ice cream be sure to drop into The Old Greenhouse Ice Cream Shop, where they serve an Abby cup for your pup: a small cup of soft ice cream with a doggie bone! Broken Stone Winery, By Chadsey’s Cairns, Closson Chase, Del-Gatto, Devil’s Wishbone, Exultet Estates, Grange of Prince Edward, Gravel Hill Vineyards, Half-Moon Bay, Harwood Estate Vineyards, Hillier Creek Estates, Hinterland Wine Company, Hubbs Creek, Huff Estates, Karlo Estates, Keint-He Winery & Vineyards, Lacey Estates, Rosehall Run, Sandbanks Winery and Stanners Vineyard all welcome dogs. Sugarbush Vineyards has two golden retrievers, while Three Dog Winery has three golden retrievers. So whether you’re traveling with your pups or just feeling the need for a snuggle with a dog, they’ve got you covered. Both welcome dogs and both have trails that make lovely dog walks. 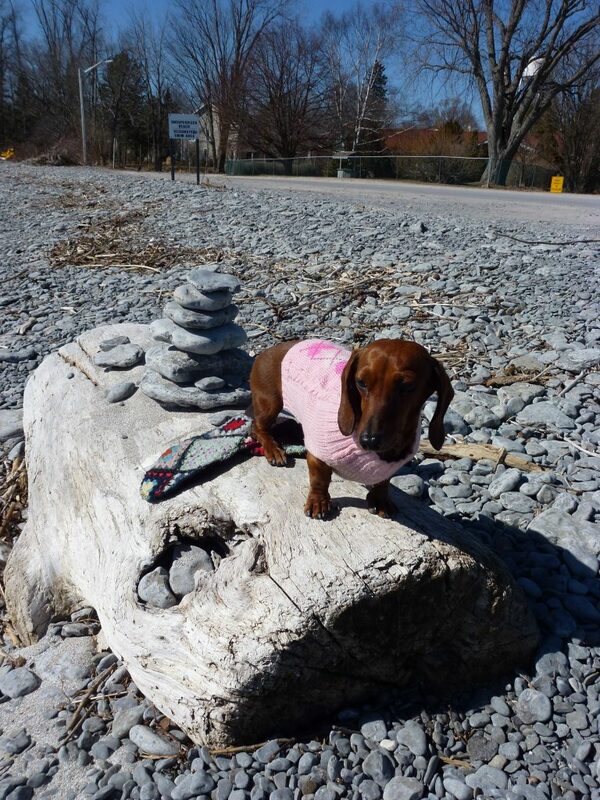 Long Dog Winery has two little wire-haired wiener dogs, Bella and Flora, and dachshunds on each of their bottles. I may be biased, but they’re the best. Best breed of dogs, I mean. Dogs are verboten at restaurants – unless they’re registered service animals – but they can be the star of the party at a picnic. 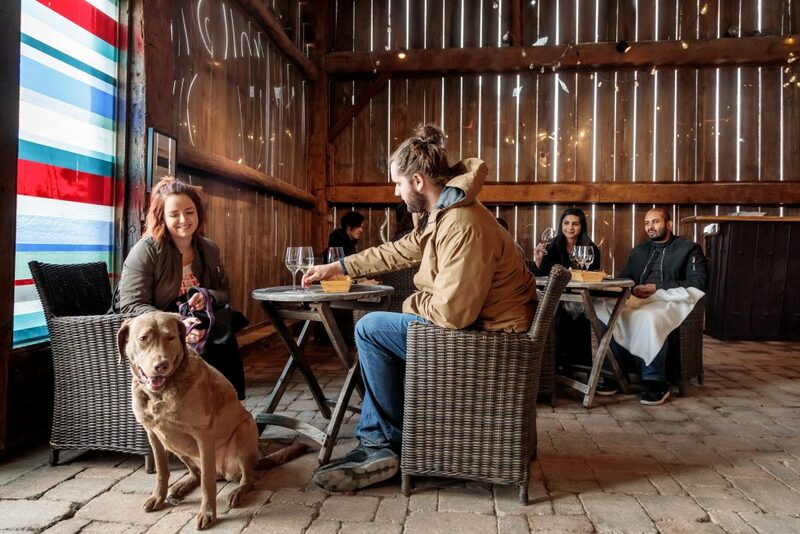 Grab a blanket and pick up charcuterie or picnic items at Schroedters Bakery, Hagerman Farms or the Agrarian Market and find a chill-out spot at a public park, conservation area or dog- and picnic-friendly winery. Remember to always clean up after your dog (that includes putting the poop-bag into a waste bin – not just the side of the trail). Not sure if it’s cool to bring your dog somewhere? Just ask! You never know who’s hiding a special stash of doggie-biscuits handy for visiting pups.